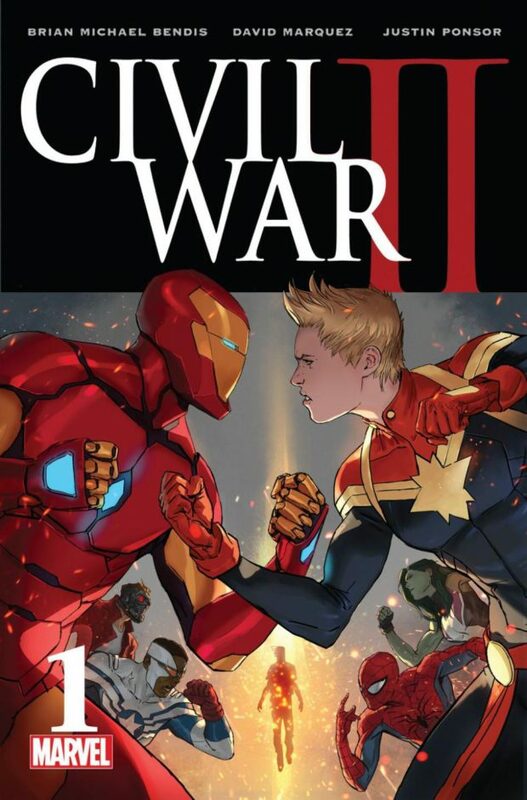 We’ve recently had a film adaptation of the first Civil War in cinemas with Captain America: Civil War and now we have the thematic follow-up to the comic story with Civil War II written by Brian Michael Bendis and art by David Marquez. The first Civil War was an ideological battle between Captain America and Iron Man who held opposing viewpoints on the idea of superhero registration. This time we have Carol Danvers aka Captain Marvel disagreeing with Iron Man over the idea of preventing a future you know is going to happen. 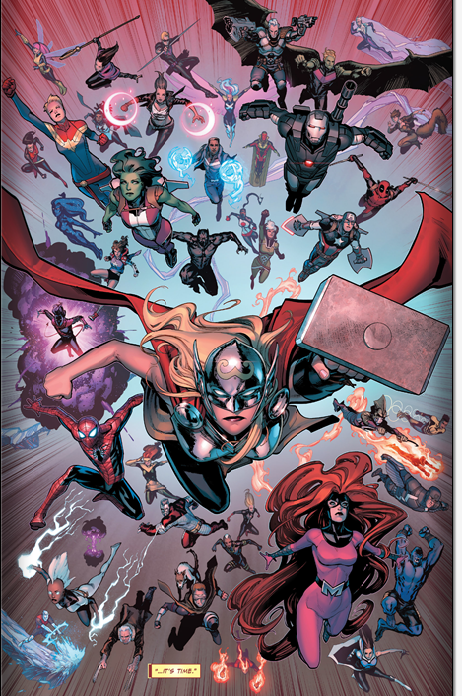 To illustrate this -pun not intended-, the comic shows the Avengers together with the Ultimates, Inhumans and the X-Men taking on a Celestial Destructor. A Celestial Destructor is basically an insanely powerful cosmic being that could wipe out all life on Earth as well as the Earth instead. All you have to understand is that this is a very bad thing and the comic puts that across really well. The sheer number of superheroes taking it on shows just how much of a threat this thing is. Thankfully it’s a battle that ends in victory and it turns out the reason for this is that there is an Inhuman named Ulysses who has the ability to predict the future. His vision provided enough of a heads up to stop the Celestial Destructor before it was able to do any damage. It’s an impressive looking sequence stretching across several pages. Normally I find these massive brawls to be far too busy with no clear indication of what’s going on but this problem doesn’t come through here. Each panel has the characters in clear focus and I found it easy to follow what was going on. It never felt too chaotic for me so I was able to take it all in and enjoy it. The banter between the team members is a lot of fun as well. I liked the choice to open up on this battle as this could have easily been the underwhelming end to a larger story but having it be the starting point before exploring the complicated differences in opinion worked really well. Much of the rest of the issue is the debate over whether knowing the future is a good thing or not. It starts off innocently enough with Tony Stark toasting the fact that they had such a great victory for a change. Everyone is present and it looks to be a light hearted affair for all concerned. There’s more hero banter that quickly shows how rich a history everyone has by virtue of how familiar they are with one another. It’s a quick reminder of the friendships and partnerships that are sure to be ripped apart by this event as it progresses. Sometimes seeing the different heroes just bouncing off one another without any immediate danger is a good thing and it’s something that Brian Michael Bendis does well though I think he loves to have characters hold a meeting a little too much judging by this and his previous work. The debate comes when the Inhumans reveal that the victory was assured by Ulysses who saw this event coming and allowed the Inhumans to help mount a defence. Sounds great doesn’t it? Surely all they have to do is keep him around and all problems can be solved before they happen. What could be wrong with that? Tony Stark doesn’t see it as a purely positive thing. He acknowledges the win they had in this case but as a scientist he questions the long term viability of Ulysses ability. Stark emphasises the fact that Ulysses can see “possible” futures that can be changed which isn’t the same thing as knowing the future. Stopping a cosmic being from invading is definitely a good thing but what if there’s a vision of one of the heroes doing something that endangers people? Do they have the right to step in and stop that from happening? It’s possible that knowing what happens could create that event itself or preventing it could lead to something much worse. It is very powerful knowledge to have and using it isn’t as simple as preventing catastrophes. Carol Danvers sees things differently. As far as she’s concerned knowing about something bad that will happen gives them the responsibility to do something to prevent it. Basically she thinks that his ability is a gift and that they would be fools not to exploit it. It could make them more effective as heroes and significantly reduce the loss of life as a result. When Ulysses has a vision of Thanos coming to Earth to find a Cosmic Cube she takes her team to ambush him before he can mount his own offensive. The events of the battle play out in Civil War II #0 but I find it far more effective to see the aftermath of it as it really lets the impact of it sink in. Seeing the discovery of James -Rhodey- Rhodes aka War Machine’s death from the perspective of his best friend, Tony was a really powerful moment as we feel the loss from Tony’s point of view and it seems far more visceral as a result. Also, having Rhodey die so unceremoniously really emphasises how reckless Carol Danvers was to take Thanos on the way that she did. Tony’s reaction is to blame Carol for what happened to Rhodey but it’s not quite as simple as that as he accepted the mission while fully knowing the risks. I’m willing to accept that Tony was so consumed by grief that he overlooked that fact for now but he also uses it as a way to prove his point about how dangerous it can be to act on a “possible” future. Arguably the alternative was less horrible considering what Thanos is capable of and this did result in him being captured but the Ultimates also suffered a significant defeat since they lost one of their own and left another in critical condition. Seeing powerful character like Captain Marvel nursing significant wounds shows how brutal a fight it must have been and having She-Hulk at death’s door hammers that point home. I can see what Bendis was going for in having the Ultimates brutally beaten by Thanos before defeating him. This scenario simultaneously shows the benefits of exploiting Ulysses’ ability to see the future while emphasising the drawbacks of it. The problem with it for me is that the scenario is far too similar to the Celestial Destructor and could have probably been solved by Carol coming to everyone to help mount the attack. I’m sure Tony and the rest of the Avengers would have went along with that as Thanos preparing to attack is a pretty big deal. Tony’s scenario about Ulysses seeing one of them about to do something that needs to be stopped is a far more interesting one and would have drawn the battle lines a lot better with more room for debate. That way it would have made both sides of the debate a murky one as everyone has to decide what to do with the information. Throwing a big gun like Thanos into the mix makes Carol’s stance look like the better one because there’s no question over what the Mad Titan is capable of. Despite that the issue smartly keeps this grounded in the characters and their established history. No time is wasted in reminding the reader that Carol and Rhodey were in a relationship so the loss is felt on both sides. She-Hulk’s dying words to Carol about fighting for the future she wants have added weight because it’s an ideal that She-Hulk died for. The stakes feel high while still being connected to the characters. Ulysses is developed fairly well as a character in these pages. It would have been so easy for him to be a largely faceless thing to be argued over but he is definitely developed as a deeply conflicted and tortured character who definitely didn’t ask for what he has. He’s just a young man given more power than he knows what to do with and is scared. If that wasn’t enough, he also has to deal with the fact that he’s an Inhuman which naturally counts as a massive adjustment for him. I look forward to learning more about him. He’s very similar to a character that appeared on Marvel’s Agents of S.H.I.E.L.D. who was also able to see the future and struggled with what to do with it. As for my stance on the issue -if anyone happens to be interested-, I’m more inclined to side with Tony on this one. I completely agree that the “possible” future aspect of Ulysses’ ability is an important one. Preventing a terrible think you know is going to happen could end up causing another terrible thing to happen in its wake. How many times have we seen heroes defined by their actions in the heat of a disaster? If Ms. Marvel -to pick an example- was somehow to not realise she was capable of more than she believes she is during one disaster then that could also prevent her from doing something she has to do somewhere down the line. It isn’t the greatest example but hopefully you get the idea. There’s also the problem of essentially playing God. By preventing things from happening you are almost dictating how you would like the future to play out and that’s a dangerous mindset to be in. Who decides what way is better and how does anyone know that the consequences are being properly considered? Ulysses as a person has to be considered here as well. He has rights and deserves to be used as more than someone who predicts danger. What does such a thing do to someone and how will he feel if his role in this causes something worse to happen? It’s a complex issue and hopefully all of the angles will be explored. Based on past Marvel Events I’m not optimistic but maybe this will be kept tightly focused. Hopefully the end result isn’t the death of Ulysses as that would be a cop out. A promising start to a complex conflict with strong cases on both sides. It’s a well written issue with plenty of great character moments and the action is very clearly drawn which makes it easy to follow. I found that having similar power levels involved in both of the disasters shown limited the concept somewhat but the pain and loss was kept focused on the characters which was a good move. So far, so good for this event but based on past experience I could see it going off the rails somewhat. Time will tell.